An important part of the Water Environment Federation (WEF; Alexandria, Va.) mission is to enrich the expertise of water professionals. To achieve this objective in today’s global economy, we proactively seek out the best innovative water technologies, systems, and management approaches that the world has to offer. 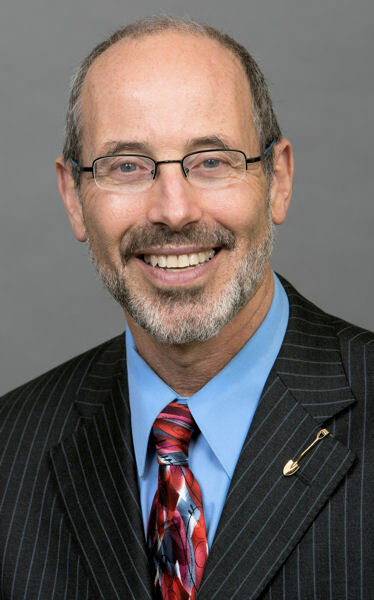 We focus on bringing the best of the best to our members, and this information is highlighted at WEF’s annual conference, WEFTEC®, many specialty conferences, free webcasts, and publications such as the The Energy Roadmap and The Nutrient Roadmap. WEF focuses on providing great value for your membership dollar. Part of this value comes from the information exchanged and knowledge gained as we extend our global reach through partnerships with several select organizations. One of WEF’s most important global partners is the Japan Sewage Works Association (JSWA), a relationship that began nearly 40 years ago. 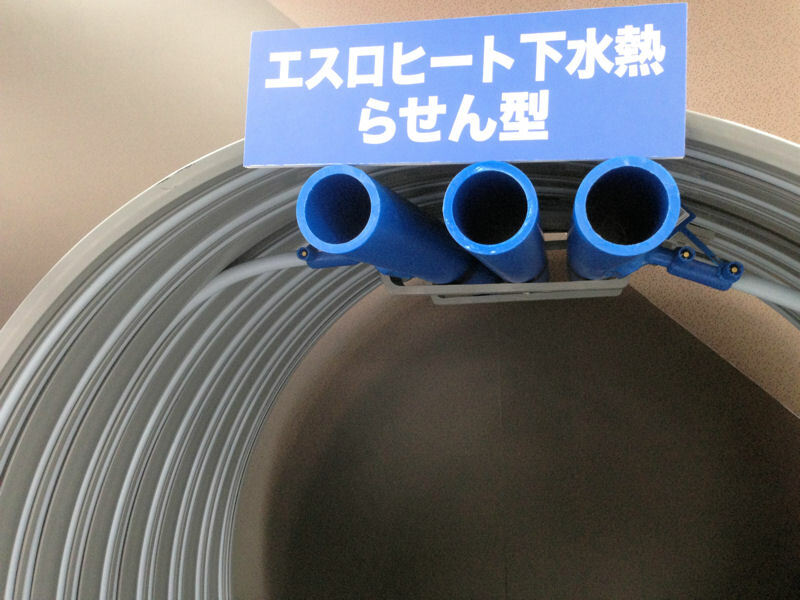 Sekisui Chemical Co. Ltd. (Osaka, Japan) developed this Sewer Thermal Heat Recovery System, a simple but effective technology to recover heat from wastewater. Photo courtesy of Ed McCormick with permission from Sekisui. Japan was a pioneer in wastewater treatment in Asia. The country’s first water resource recovery facility (WRRF), a trickling filter facility, began operating 93 years ago in Tokyo. Since 1962, JSWA has helped enrich the expertise of its 3500 organizational and individual members through a broad educational program. JSWA representatives regularly attend WEFTEC, which helps the organization identify global trends for their members’ benefit. 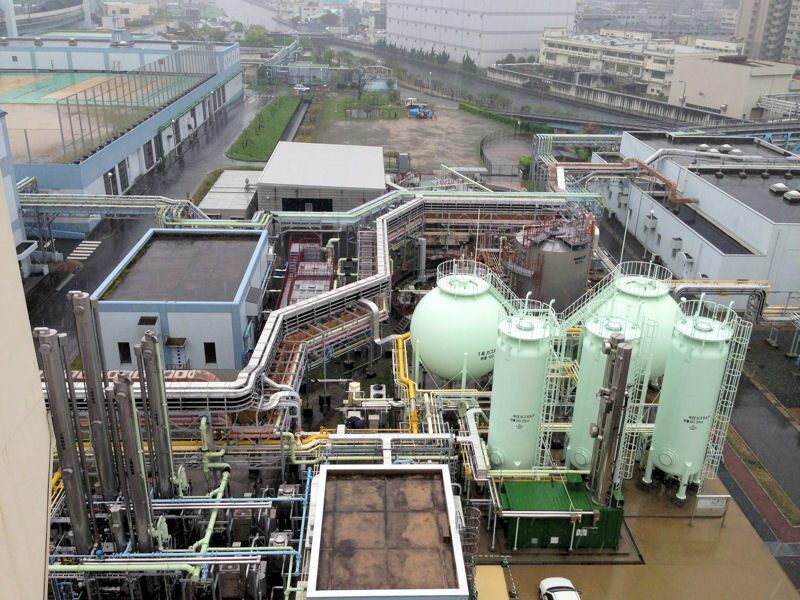 The City of Kobe, Japan has an advanced resource recovery facility that produces clean natural gas from its egg-shaped digesters. Photo by the City of Kobe courtesy of McCormick and the Japan Sewage Works Association. Recently, JSWA and WEF have raised collaboration to a new level. JSWA invited me to speak to several hundred of its members about turning wastewater and high-strength organic material into clean, renewable energy. In April, I traveled to Japan and met with officials, engineers, operators and maintenance staff, researchers, and technology providers in Kobe, Osaka, and metropolitan Tokyo. We discussed the benefits and “lessons learned” by North American utilities striving to become energy-neutral. Most WRRFs in Japan do not use anaerobic digestion, but many are planning and designing facilities to do so in the future. JSWA now is translating WEF’s Energy Roadmap into Japanese and plans to provide electronic versions to all of its members at no cost. 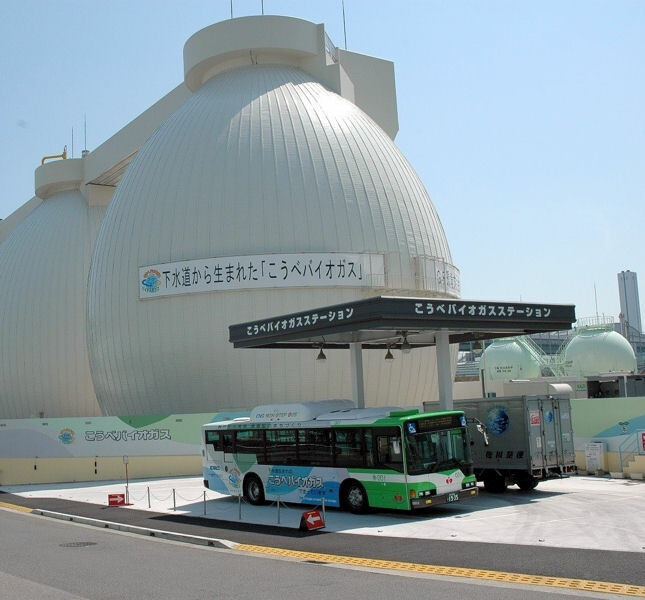 Biogas produced by the City of Kobe, Japan fuels city and private vehicles. Photo courtesy of McCormick. But with more than 95% of WEF members residing in North America, you may ask how the majority benefit from global knowledge exchange. The answer is many WEF representatives, including myself, bring back innovative ideas implemented elsewhere that can benefit utilities, engineers, scientists, researchers, and technology providers at home. For example, a recent Water Environment Research Foundation (Alexandria, Va.) study identified 80% of the available energy in wastewater as thermal, but it is not yet common in the U.S. to recover heat from wastewater influent. In Japan and Europe however, several facilities already recover thermal energy from wastewater. The City of Kobe’s main facility is one of the most advanced WRRFs in Japan, producing clean natural gas from biogas-producing digesters that fuel vehicles. Front row, fifth from left, Ed McCormick, WEF President 2014–2015, sits with staff of the City of Kobe, Japan water resource recovery facility. Photo courtesy of McCormick and the Japan Sewage Works Association. With a population of approximately 127 million in a geographic area slightly smaller than California, Japan is very densely populated, and its mountainous terrain means there is little available land for biosolids land application or landfill disposal. The Japanese water sector is interested in learning more from North American and European utilities about cost-effective approaches to biosolids recycling. Incineration is the primary method to handle biosolids in all locations, but North America and Europe use advanced technologies that approach energy-positive results in a cost-effective way and recycle incinerated biosolids for use in construction materials and for fuel. North America’s water sector can benefit by learning from Japan’s proactive and state-of-the-art odor control systems. Japanese utilities do a great job as “good neighbors,” earning strong public support for the utilities as they consider beginning resource recovery. Because Japan relies on incineration, biosolids treatment is energy intensive. “Resource recovery is very important not only for wastewater utilities but for the entire society,” said Hisataka Sokawa, director-general of JSWA. The City of Osaka, Japan, which has a population of 3.6 million, provides public outreach and education about water in a $6 million museum of water. Photo by the City of Kobe courtesy of McCormick and the Japan Sewage Works Association. 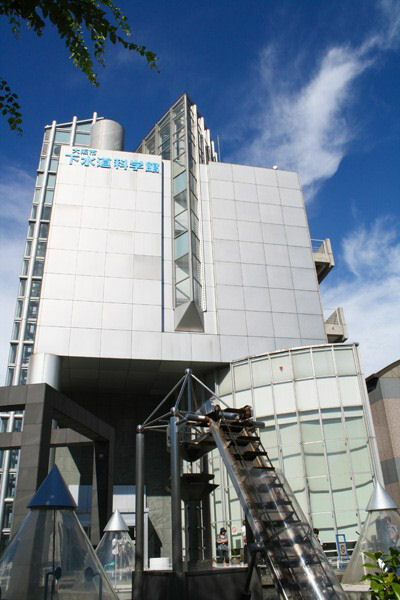 The City of Osaka dedicated $6 million to opening a wastewater science museum that provides public outreach and education, particularly to the thousands of students who visit each year. In North America, we should be considering similar environmental and water museums to help educate our citizens about the importance of water treatment and value of water. WEF, JSWA, and the European Water Association (EWA) jointly convene a specialty conference every 3 years. The most recent conference was Energy and Water 2015, held June 7–10 in Washington, D.C. It featured resource recovery experts from five continents, and was co-located with the Residuals and Biosolids Conference 2015, sponsored by WEF and the International Water Association (IWA; London). More than 1200 water leaders attended these two conferences that focused on cutting edge water resource recovery. WEF and our key global partners, EWA, IWA, and JSWA, hope you will be part of this global collaboration, so we can all learn from each other as we all strive toward continuous improvement of the water sector.